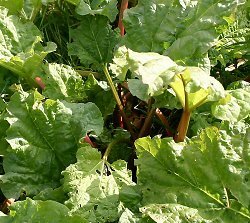 As my regular readers will know, I enjoy growing my own fruit and am particularly proud of my annual crop of rhubarb. John, the owner of my local garden nursery, has even said it's the finest he's ever seen - and he's seen a lot of rhubarb over the years! Rhubarb is one of those foods that people seem to love or hate, nothing in between. Personally I love it and the fact that it's actually good for you is a bonus. Rich in iron and high in fibre, rhubarb makes for a great dessert whether stewed or in pies and crumbles. Served hot with fresh vanilla ice cream, whipped cream or custard. Delicious! But what about a cold rhubarb dessert? Well, there's rhubarb yogurt which is nice but what about even colder than that? Rhubarb and custard popsicles! Simple but unusual and on hot days this summer it could prove a real winner for the family. All you need is your freezer, a set of popsicle molds, some popsicle sticks, about 1 1/2 lbs of fresh rhubarb chopped into small pieces (obviously stalks only! ), 3-4 tablespoons of sugar (according to taste), 1/2 pint of heavy cream and 1lb of vanilla custard (ready made or homemade, cooled). Cook the rhubarb, water and sugar together in a pan for about 5 minutes then put to one side to cool thoroughly. After whipping the cream into peaks, stir the custard into it well. Take the popiscle molds and fill each one first with a spoonful of cooled, cooked rhubarb followed by a spoonful of cream/custard mix. Keep the process going until each mold is filled. Place the popsicle sticks into the mixture/molds and then put in your freezer for about 5 hours. For those of you who thought rhubarb and custard was only a hot dish for a winter's evening, think again!